Making Torrijas - Gather the Ingredients (c) 2007 L. Sierra Licensed to About.com. 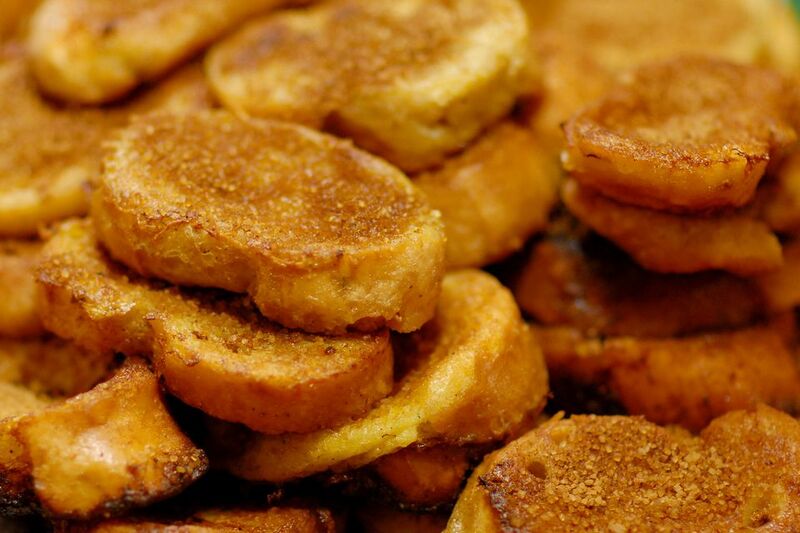 Although torrijas are a popular breakfast food, they can be eaten any time of the day. There are many variations of this treat – some soften the bread by soaking it in wine, while other variations use milk or water and honey. In Spain, the typical bread would be a French-style baguette, but today pan de molde or white bread, such as Wonder bread can be used. Most variations serve it with sugar and cinnamon. * TIP: If you do not have stale bread on hand, lightly toast the sliced bread so that it dries out enough to soak up the milk and not turn to mush. 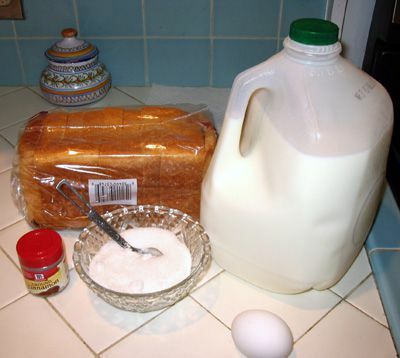 Making Torrijas - Mix Milk & Egg (c) 2007 L. Sierra Licensed to About.com. Pour the milk into a medium-size mixing bowl. Add the egg and beat together. Add vanilla extract, if desired. Pour enough oil into a large frying pan to cover the bottom and heat on medium. Be careful that the oil does not burn. Making Torrijas - Soak the Bread (c) 2007 L. Sierra Licensed to About.com. If you use a stale baguette, slices should be at least 1/2 inch thick. If the bread is more than a day old, you may need to soak the bread for 2-3 minutes or more, so that it softens up. Be careful that the bread does not soften so much that it crumbles when you lift it out of the bowl. Making Torrijas - Cook the Bread (c) 2007 L. Sierra Licensed to About.com. After 2-3 minutes, check the bottom of the bread. As the slices turn golden, turn each one. You may wish to use a nylon spatula or tongs to turn the slices over. Make sure that you have enough room in the pan to turn the slices. Making Torrijas - Sprinkle with Sugar & Cinnamon or Honey (c) 2007 L. Sierra Licensed to About.com. Remove each piece from the pan and place on a plate. Sprinkle the top with sugar and cinnamon. If you prefer, drizzle honey over the top. Serve immediately. Note: If the torrijas cool down and you wish to heat them up, place them back in the frying pan on low heat or in a toaster oven at a low temperature. Do not place them in a microwave because this will cause the bread to become rubbery. If you are eating torrijas for breakfast, learn tips on preparing great coffee or cafe con leche in our FAQ What are Spanish Breakfast Foods?